Looking for an easy way to use videos and images to control your DMX lighting? Here it is, a fully integrated media server right inside a lighting software. Simply select files from your computer hard disk and you're ready to go. Live video input is also supported, letting you use any video capture cards, cameras and even network video streaming. The main goal is use your media to control the lighting fixtures, from RGB LEDs and simple dimmers to complex DMX moving heads. One popular usage is to show videos on a LED wall. This is also called pixel mapping and Lightjams is great at it. But why stop there? 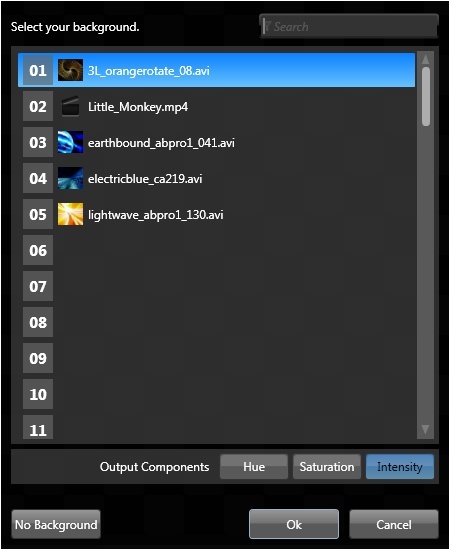 You can use the video hue, saturation and intensity attributes to control the pan and tilt of your moving lights! You can load up to 64 media files from your hard drive and from live video sources. Once loaded, you can trigger, transform and mix them in countless ways in real-time. Supported media: video and image files, DirectShow compatible video capture devices (most USB cameras and capture cards), MJPEG and JPEG video network streams. About every video and image formats are supported: .mov, .avi, .wmv, .mpeg, .mp4, .mp2, .mkv, .webm, .ogv, .ogg, etc. Name it! For images: BMP, JPEG, PNG, GIF (also animated), TIFF, etc. Install these free video codecs and you're good to go: LAVFilters. If you don't have the proper video codec enabling you to directly play a file, you can use the included video transcoder to quickly convert it. The transcoder also optimizes the video playback performance by resizing the videos, selecting an appropriate bit rate and removing the audio tracks. The video playback speed can be continuously adjusted via the master speed and all sub-master speed sliders. Videos automatically loop without noticeable pause or delay. This is perfect to use small VJ video loops. You can use any DirectX capture devices like a webcam, a video capture card and your own screen output to get live video in Lightjams. MJEPG and JPEG network video streaming is also supported! Access the Media Server configuration by going in the View/Media menu (Ctrl-U). You'll see the loaded media and be able to browse your computer for other files and video sources. I'm giving you these video loops to get started. The way to use your media is to assign them to grid's backgrounds. At any time, you can assign them by going in the Grid/Background menu or right-click on a grid in the Grid Manager. The media are automatically resized to fit your grids. Bins: Select the media bin to be assigned. Components: Media are broken down into three components: hue, saturation and intensity. This corresponds to the HSL color model used in Lightjams. Every video playback speed is individually controllable. It is obtained using the highest speed of all grids using the same video. When all grids using the same video are deactivated, the playback position automatically restarts. So when at least one grid is re-activated, the video will restart playing from the beginning. Only the media paths are saved in your project file - not the actual media data. The paths are made relative to your project file. For example: If your project file is in c:\myProject and you put your media inside the c:\myProject\Media subdirectory, then in your project file, the media paths will appear as in the \Media subdirectory (without any reference to the myProject directory). 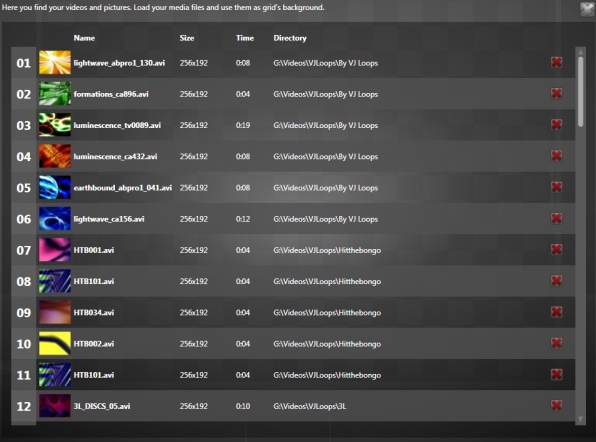 This way it is very easy to move and backup your project and media at once by just processing the myProject directory. This also means that when you move your project file, you need to maintain the proper directory structure for your media. What's next? Try Lightjams for free! ©2019 Lightjams inc. - The DMX Lighting Controller Software for Live Performances. Proudly made in Montreal, Canada.